• Summer maize had already been harvested and the production was normal, likewise summer paddy is being harvested. So there is food stock sufficient for 4-5 months from recently harvested maize and previous stock of wheat in more than 80 percent HHs. • Employment opportunities from agriculture, development activities & construction works including tourism are reportedly available. • There is sufficient food stock in the market to fulfill the demand and the price of rice is also normal (increased by 6-8 percent in compared to last year). • People rely on traditional livelihood mechanisms such as wage labor, selling of agricultural-livestock products, out-migration during this period. 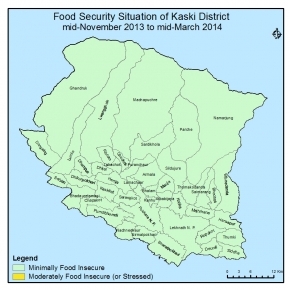 • The food security situation of the district will remain the same as Minimally Food Insecure. • Sale of cash crop (green vegetable) and livestock product (meat & dairy) will be continued. Similarly there will be regular income from remittance and wage opportunity will also be available from agricultural, development activities & tourism. • People will rely on traditional livelihood mechanism such as wage labour, sell of cash crops, out-migration.